This was created on Nov 7Th 2007 on the eve of Diwali. It was a challenge from my husband to create a sugarless cake/halwa, with no ghee or butter added, but still be tasty and healthy for him for diwali. What I created was very tasty but I realized that it tasted better as the days went by .The preparation takes less than 10 min but needs some time in the fridge for it to be set to be cut and served. I think this is a good entry for me to sent to Eat Healthy: Fiber rich event hosted by Sangeeth's Art of cooking Indian Food for the month of June. 1. Place the nuts in a plate and microwave it for 3 minute. Please do it in 30 second increments. 2. Place all the chopped dates, figs, currants and raisins in the food processor and keep buzzing until they all come together and look like one mass.It need not be grind to a paste. A few pieces here and there is fine. 3. 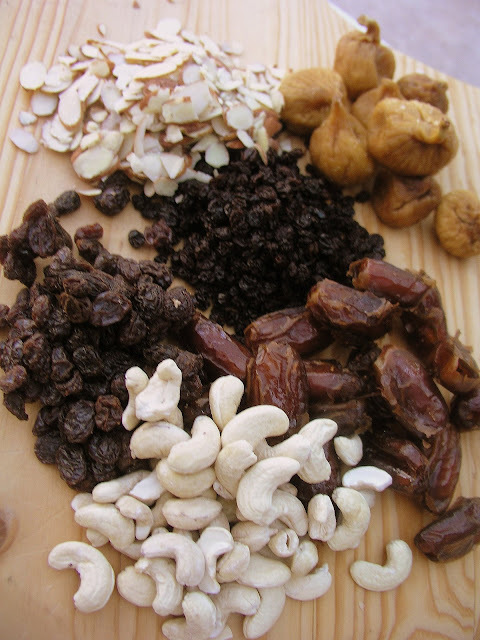 Remove the nuts from the microwave and roughly chop them and add it to this dry fruit and mix them well so as to distribute the nuts evenly. 4. Transfer this mix on to a tray lined with wax paper. Place a cling wrap or wax paper and use the flat bottom bowl or another tray to spread the mix even around the tray. 5. Place this in the fridge for some time and then cut and serve. Bookmarked for diwali! Very nice!